“Millie sit.” “Good sit.” Poised on her back haunches, her head drops and ears flatten as she focuses on my every move. If I twitch a finger, she begins to stand. “No, sit!” “That’s a good girl.” I stay still as an old oak, slowly moving my palm out in a stop position towards Millie and give the command, “Wait.” Her head tilts. I say it again before throwing her beloved toy about twenty feet away. As I begin to turn and take a step in the direction of the lifeless tug toy, she lifts her rear and I quickly must utter “Eh, Eh, Millie SIT.” “WAIT!” I take a deep breath. “Good wait.” Millie tightens the coil of her body’s spring. Moments later, I release her from her wait with an enthusiastic “Okay!” And off she runs, full pelt towards her toy. Every day our training regime includes work on sits and waits. As often as not, Millie does not want to abide by these commands, viewing them as optional. Naturally, I disagree. “What’s the point?” our little teenage puppy must be musing. She is a party girl who is simply on the move and wants to have fun. She loves to bound across the ground, run through tunnels, jump over obstacles, and return as quickly as possible with her toy for a good game of chase or tug-of-war. When her toy is not to mouth, she’s happy to follow after and catch leaves, snowballs, or Sam’s tail. Anything that moves is fair play. It isn’t possible to sweep the floor or rake leaves without Millie pouncing on the broom or rake. Fortunately, her chase impulse does not apply to birds, rabbits, sheep, horses or cattle. We don’t know about cats. It’s January and cold outside, so what’s this butterfly doing inside? During this time of year, we daily light the wood burner in the morning and cover the veg beds at night to keep the frost off the plants. This is not the time of year for a butterfly. While Small Tortoiseshells can turn up almost anywhere, from city centres to remote wildernesses, they do like it where nettles grow. We have nettles in abundance, but not in the kitchen. So hibernating in the barn, the wood pile, or one of the outbuildings makes sense. But our kitchen? It’s too cold to implement our usual catch and release approach which we utilise regularly with moths, bees, butterflies, bats and birds which find their way inside during warmer months. Sadly, we don’t have any flowering plants inside for this butterfly to find nectar. It’s lifespan is significantly reduced by choosing our kitchen as its launchpad. To calm and distract Millie, the dogs and I head to sit by the fire while Roger places a small ramekin filled with sugared water and a ball of tissue paper near the window where the butterfly has settled. The least we can do is feed it while it makes its home inside our house. Armed with glasses of wine, Roger joins me and the dogs by the fire. Sam has found a comfortable spot and drifts into a deep sleep, perhaps dreaming of his younger days when his back legs had him jumping over stiles. But Thoroughly Modern Millie has sneaked out of the room unnoticed until we hear a gentle clinking of ceramic on stone. Getting up to investigate we find Madam in the window, drinking the homemade nectar. The Small Tortoiseshell may be one of the most common butterflies in the UK, but it is also the national butterfly of Denmark. Sure, it is mischievous and disobedient of Millie to be in the window, but more shocking, and perhaps treasonous, is that she ate the butterfly! 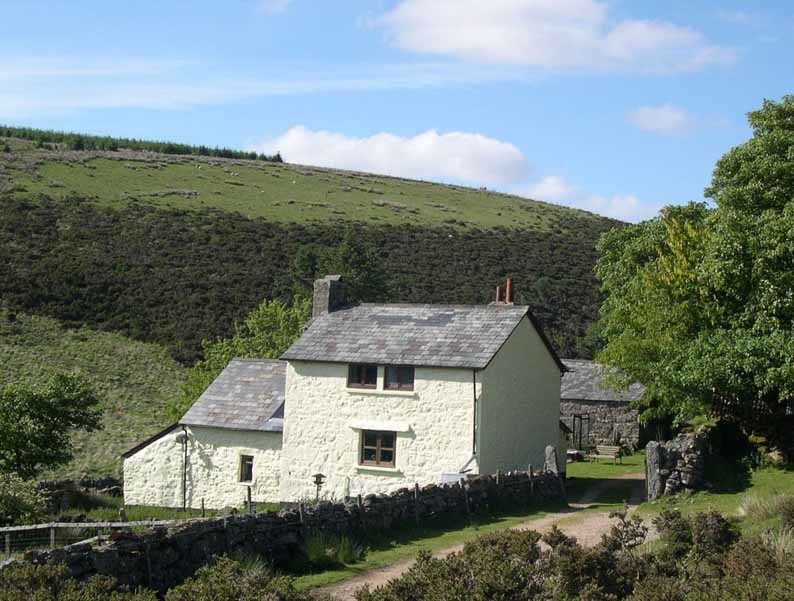 It isn’t easy gardening in winter, let alone on Dartmoor. The UK, with its distinct seasons, offers a challenge to keeping a year round vegetable supply. By late autumn, it feels as if there is nothing left to harvest after the near glut in summer. Even in spring, as plants are beginning to grow, there are too few things ready to harvest. We’ve had to learn about what to grow and when, protecting our vegetables, and making use of different vegetable varieties to fill empty spaces in the garden. So far, the new and improved raised beds, which Roger built this past spring, complete with their chicken wire surround to keep out pesky critters, are working a treat. We have been feasting the past few months on kale, beets, spinach, winter purslane, radishes, and land cress. The rainbow chard is beginning to look pickable and our spring cabbages are blossoming out to a respectable size. Our progress comes as a huge satisfaction. Growing for winter is truly a year-round job. It begins in the summer when we must resist being seduced by the bounty of veg we gather at that time, staying focused on the leaner months of autumn and winter to follow. By October, light levels are low, affecting the speed of germination. Add in a healthy dose of wind, rain and cold, which begin to dominate the weather forecast, and it is tempting to throw in the trowel. As is our style, we ignore all the obvious discouraging signs and charge ahead. 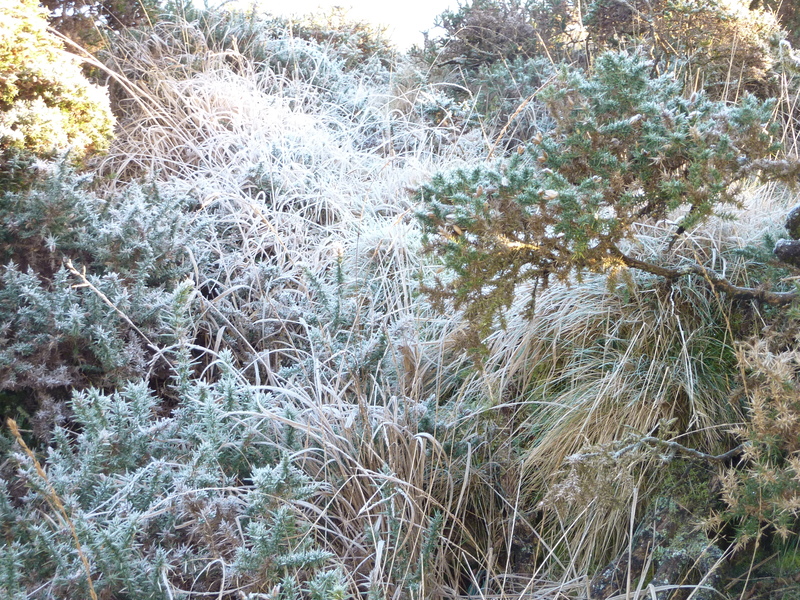 A typical frost covering the plant life on the hillside. We’ve never had much luck with leeks, and so didn’t bother this year. But now, I’m regretting having not given leeks, garlic and more onions a spot in our winter beds. In reading up on these edible alliums, I discover that garlic actually needs a period of cold and so wants, nay begs, to be in the ground and growing well before the arrival of winter. I will need to make a note for next year in my little black book. We have a forecast of snow for later today, so Roger has just put on his waterproofs and headed out to cover the beds with horticultural fleece. Most days this autumn and winter have been easy for us to tend to the garden. But this week it feels like wind, rain, freezing temperatures, rabbits, slugs, and a host of other challenges are joining hands to welcome us each time we go out to pick some lettuce. I have half a mind to forego our Five-A-Day. 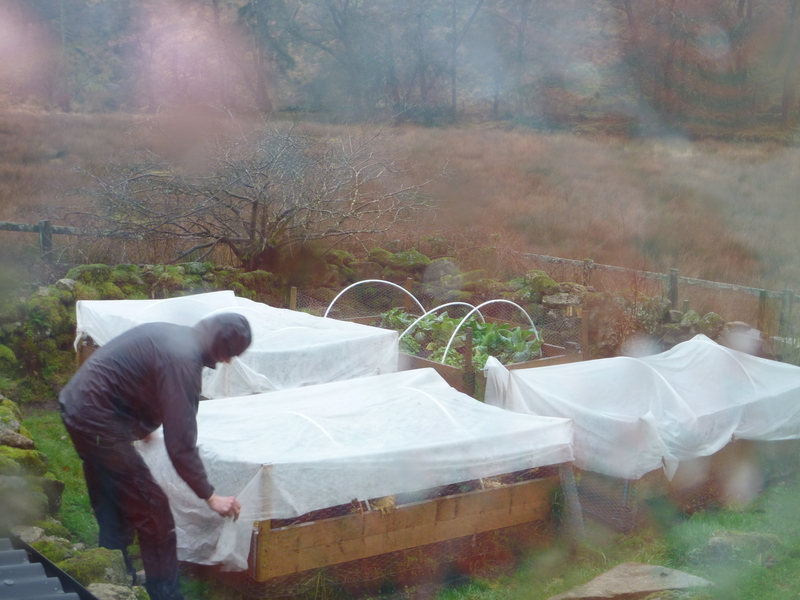 Roger outside in the rain and sleet protecting the veg beds. Despite all the challenges, lettuce does well through the winter as does spinach, which actually is easier to grow in winter than in summer because it doesn’t go to seed so quickly. We are always thinking about what to grow and whether or not to bother. I don’t have any interest in growing peas and beans, they aren’t suited to our location. Nor, do I have any interest in Brussel Sprouts. Despite how much I love them, they take up too much space in the garden. Winter gardening also involves planning for the spring. While sitting by the fire with the snow coming down, thoughts drift to: What will we repeat? What will we try new? What will we completely abandon? Two years of aubergines and we aren’t going to bother again. They grow, they flower, and then nothing. It’s best to learn from mistakes and build on our successes. With that in mind, Roger has purchased several fruit bushes which do well in acidic soil. Where to plant these is yet to be decided, but we will need to get them in the ground soon. Of course, my make shift bird netting for the blueberry bushes will no longer do, so we are discussing how to go about building a fruit cage which will be easy to access and yet not blow over in some of the strong winds we get in our moorland valley. Despite this new challenge, which we brought on ourselves, we are both looking forward to growing more fruit. While the rain hammered down this morning, I was dry inside the greenhouse giving it some attention by tipping out pots with finished plants from the summer, pulling weeds which are making their home inside the greenhouse, watering the strawberry plants, and giving it a good sweep. In the early spring, we’ll take everything out and clean the glass and give the floor a scrub to rid it of moss and mould, but there’s no point doing this in winter. With our winter garden, it’s vegementary, really. It’s all down to the planning. Typically, we have big gaps form March through May and in the past, November onwards. Not this year! We gave some thought to how we were going to rotate our crops in the raised beds and when we needed to plant things out for winter. Because there are any number of things that can go wrong: Some leafy crops are prone to bolting; caterpillars seek out and find cabbages; there’s club root, flea beetles, birds, slugs, snails, whitefly, and heavy rains, and strong winds. It’s apocalyptic! But the stuff that survives, thrives and provides, delights us. Really, we just try a few things, see what works and then repeat. After weeks of rain, we awoke one morning to a covering of snow. By my mid-Western standards, it wasn’t a significant amount, but those three inches did a wonderful job of covering up the mud and layering the land with a fluffy white blanket. We were both awake early and took the opportunity for a walk before the crowds of snow-crazed people arrive to go sledding, build snowmen, and generally leave behind a mess from their enjoyment. For us, the chance to be out first, looking for tracks of foxes, badgers and rabbits is exciting. We found plenty of rabbit tracks surround the house and garden confirming the need for diligence as we plan our summer vegetable planting. Thankfully, there were no paw-prints from foxes anywhere near our chickens. No signs of badgers either. It seems our electric fencing is working to protect our hens. Oblivious to any predatory risk, the chickens head out to greet their first snow of the season, clucking a mixture of confusion and delight: “This stuff is pretty and makes my feathers look so fetching but where is the mud and how am I to find worms here?” Or, something like that. It’s still early and the morning sky emits shades of light suggesting more snow to come. We make our way up the path toward the woods and tors, knowing we are the first to lay our boot-tracks in this snow. Roger has a buoyant gate as if he is expecting something exciting to cross his path. Aromas buried beneath the white, flaky ground cover enchant Sam. And I’m taking a few photos to hold onto this moment where it feels as if Dartmoor is revealing her secrets to us only.